A 9 year old student from Scotland is photographing her school lunch every day and sharing it with the world. Her blog is called Never Seconds and much like I did in 2010, she takes a picture of her lunch and blogs about it. She calls herself “Veg” and she only started less than a month ago and her blog has already gone viral. I don’t know what prompted her to go forward with a school lunch blog because she doesn’t explain her inspiration. I applaud children taking an active role in school lunch reform. At one of my schools, one classroom did a research project on cafeteria waste. Every day for a week they weighed trays prior to being tossed in the trash. The students found that more than 700 lbs of food was being thrown into the garbage each week. The students noticed that much of the waste was meat and the term “pink slime” was brought up. I was not involved in the project, but the teacher may have been inspired by my book. After the students finished their analysis of the food waste, they made posters and put them around the school encouraging other students to be aware of cafeteria behavior. Finally, the students ended up deciding to launch a petition to get other students involved in advocating for better food at school. I’m impressed when students turn into advocates — they are the best advocates for themselves, especially when adults forget that the students are the first priority. 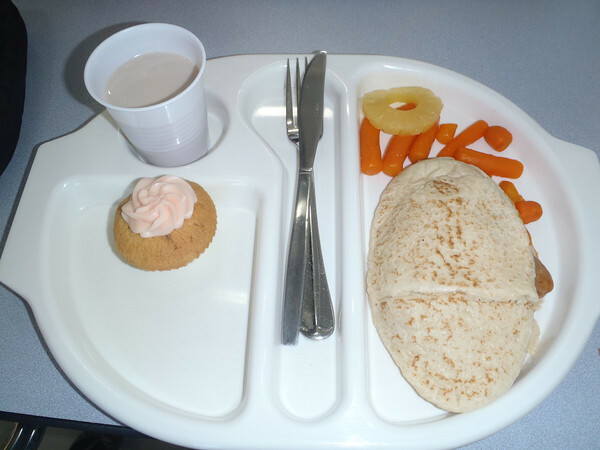 The Scottish “Veg” student has already made in-roads into changing school food at her school. Putting pictures online is a great catalyst for change. Ahem. My students are lucky — they got (two!) salad bars a couple months ago. The school has two cafeterias that operate simultaneously to feed almost 1,000 students hence the need for two salad bars. I haven’t been able to snap a picture of them because with my schedule there just isn’t one free moment. However, I explained to some students that the salad bars are the result of advocacy for fresh food. The students have the option for mini-salads every day. It will take time for some students to adjust, but the teachers seem to enjoy the lettuce and tomatoes! The salads look terrific — again sorry no pictures. I don’t carry my phone around with me! One of my goals when I started on this journey was to see a salad bar at my school and when I did, I just couldn’t believe it. I like to think that maybe, just maybe, what I did for a full year was a teeny part of why that happened. I wish “Veg” luck in her school food journey! “Veg” has gotten over 1.4 million hits on her blog in only a few short weeks. This is very exciting! I hope she is able to act as a catalyst for change in her own school. Speaking of, in the picture, what IS that oval thing? The oval thing is a pitta bread! This is the standard of what we are feeding our kids here in Scotland and it is not good. Keep up the good work Martha.